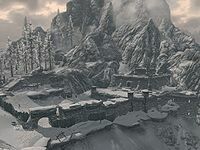 Fort Kastav is a fort northwest of Windhelm on the main Whiterun-Winterhold road, initially occupied by warlocks and skeletons. During the related civil war quests, the fort becomes occupied by either Stormcloak rebels or the Imperial Legion. The fort is situated in a mountain pass which it spans almost completely, leaving only enough room for the road. It has skeletons patrolling the walls, and one on a lookout post. The compound houses two powerful mages who will emerge and attack if the skeletons raise the alarm. The interior comprises two areas: the Fort Kastav Prison and the Fort Kastav Captain's Quarters. There is a trap door near the southern wall leading into the prison. The exterior of Fort Kastav is quite impressive, making use of the natural features of the mountain and boasting many lookout platforms and an extensive ramp system. When approaching from the road use the main entrance onto the grounds, or the platform ramps in the eastern corner can provide a more stealthy approach. Once inside the walls find a grindstone next to a small shed that contains an alchemy lab and a potion. The prison section is on the ground level of the fort, and the Captain's Quarters are located on the second level; each with a main door entry. The fort boasts a tower that forms a third level, but can only be accessed via a ladder in the Captain's Quarters. The prison can also be accessed via a trapdoor found by following the snowy ledge along the exterior of the bulwark heading south. If entering the prison through the main doors, you will begin on a staircase landing guarded by a skeleton. The landing extends onto wings to the right and left but holds nothing of value. Down the stairs is the lobby and an illuminated area with a table, shelves, and an unlocked chest. The shelf holds a potion and a coin purse. A Fort Kastav Prison key is on the table. Located across from the table is another shelf holding assorted weaponry and a leveled weapon is on the adjacent weapons rack. The double wooden doors to the left of the table lead down to the main prison area where a necromancer and a skeleton are waiting. The guard's area is on the upper level and provides a view from above into each prisoners' cell below. There are five prisoner cells at the bottom of the stairs and each are opened with the Fort prison key. However, there is little of note in this area aside from the style of the prison cells themselves and a serving of dog meat in each. Rather, explore the guard's area. The shelf immediately to the left of the doors contains a potion, and other alchemical ingredients. An unlocked chest is on the far side of the room on the south wall. A second fort prison key can be found on the table, or on the floor after becoming displaced by the necromancer. Back in the lobby, the open storage room on the west wall contains nothing of interest other than a ladder back up to the exterior of the fort. Exiting here will put you on the far south end of the fort overlooking the main road. There is no access to the Captain's Quarters from the prison. There is a weapon on the weapon's plaque next to this storage room door. From the main doors into the Captain's Quarters you will see a table with a bottle each of wine and Alto wine, and a shelf with a selection of goat and eidar cheeses. The ruined storage area at the bottom of the stairs holds an unlocked chest, but little else of note. To the left of the main doors is a raised area serving as the captain's bedroom. Here you will find a small table with a scroll of Conjure Frost Atronach and an apothecary's satchel. An unlocked chest is at the foot of the bed, and an end table holds a copy of the Block skill book Warrior. On a table is an assortment of armor. A ladder next to the bed leads up and out to the fort's tower. A sacrificial altar is on the tower and offers a scroll of Conjure Familiar, a sample of fire salts and void salts and a bowl containing some loose gold, a Pine Thrush egg and nightshade. The trapdoor that leads outside the Captain's Quarters appears to be levitating.